I have this TLR for over a year by now. It has been a pleasant experience with this classic camera and it is time for a report to share what I get fascinated with this TLR and perhaps note down some difference in experience that I have with the Rolleiflex Automat MX-EVS. First of all, it has a built-in meter and it is a convenient feature to have. My Yashica works surprisingly well with the built-in meter when I first got it. After halve year of storage, I forget to unload its battery and I got its metering all ruined due to corrosion of battery. I opened up the top waist level finder and it seems like a do-able job to re-wire the metering but so far I have not attempted to fix the broken meter. Instead, I added a Sekonic flashmate L-308S to help with the metering. 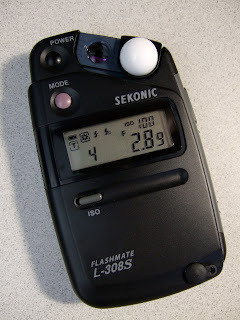 The Sekonic light meter works quite well with my Yashica. I tried both b&w and color films on my Yashica Mat 124G and both come out nicely. The Yashinon 80mm f/3.5 is reasonably sharp and has good contrast in the color photos. The next thing that I need to try is to use it more on various films and research if I can use a flash on the Yashica. The Yashinon 80mm f/3.5 is reasonably sharp and I am well pleased with the results. The built-in meter is a nice feature to have but mine is unfortunately broken. It is important to remember my lesson to remove the battery when not in operation. Unlike the Rolleiflex Automat MX-EVS that I had, its focusing screen is easier for me to focus. The ground glass with circular rings along with the magnifier provide me enough detail in good lighting to focus at ease. It takes some practice and it is more difficult for indoor type of lighting. Overall, I think I find focusing easier on the Yashica than my Rolleiflex. The film rewind is not as refined and controlled as the solid rewind lever in the Rolleiflex. The rewind lever in Yashica does not give you the confidence for long lasting lever. The build quality in Yashica can't match the solid build quality in the Rolleiflex. The build in Yashica is good but not outstanding like the Rolleiflex. I managed to open up the top portion of its waist level finder and I managed to clean up the internal mirror housing and it can be done with caution. Re-assembly can be tricky and I will try to update this post with links to instructions for cleaning the internal mirror. It is lightweight and that is the best part about this TLR. With a good neck strap, this TLR is very portable for hours of shooting. You will end your film roll wanting more to continue the shooting. It is very pleasant to carry around for a longer period of shooting time as in a half day of shooting. I recently use the Yashica with a lightweight tripod and I can frame with more confidence for critical angle and position. The Yashica opens up my desire for more square photos in 6x6. It is very addictive in the process. It is unfortunate to note that many Yashica Mat 124G are over-priced in the used market. It used to be in the $100's and now a good copy is frequently bid up to over $200. And it is always a risk on the unknown conditions subject to the mercy and honesty of the seller in the listing. My copy is likely not the norm in the eBay as it is just really in Excellent condition and I was one of those who bid Yashica over $200. Shame on Hin! In my opinion it should be much less as in $150 or so. "In my opinion it should be much less as in $150 or so."